This is my creamy entry, a creamy buco-fruit salad we prepared for Mom's birthday last month. The shredded young coconut was brought from our hometown province to our home especially for my Mom's birthday, young coconut costs 75% less in Laguna so our relatives there always bring a lot of this fruit whenever there's an occasion to celebrate. Anyway this salad has a lot of all-purpose creams and condensed milk in it mixed with fruit cocktail, nata de coco and creamy corn. It's so cool, fresh, creamy and delicious! Go try this one out! That looks scrumptious! Lots of yummy desserts today. I'm gaining weight looking at the photos! That looks like a good recipe! Hope you enjoyed it! Ca I pick the young coconut only! I miss it so much! hmmmnn..i miss having fresh buko in my fruit salad! i'm too lazy to buy fresh young coconut from the market. This looks a lot like a coconut fruit salad they serve here in the states although I doubt our coconut can measure up.... lovely. Mine is up here. Wow! 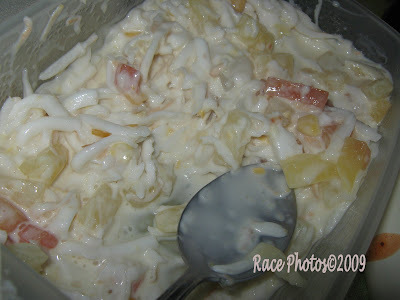 that's my fave desert-- buko salad! am salivating now.. huhuhuh! yummmmm! ayayay!!! sis, ang sarap naman nito! this one's my favorite! huhuhu! you got me drooling here!